As I've stated before in my reviews, I've had a very love/hate relationship with Wayforward. This would be expected of a company that regularly produces tie-in games that, while above the usual standards of such games (Thor: God of Thunder DS, Justice League Heroes as examples) but even taking these games out of the equation (which are likely used to fund their more creative games which is understandable), they do produce games of varying quality. This is more of a testament to Wayforward's creativity to the point where I think that the company is at their worst when they make games that try to emulate other, better games in a given series (Contra 4, Bloodrayne: Betrayal) and at their best when they create a new genre altogether. Mighty Flip Champs is their best game for this reason. The one universal constant of all of Wayforward's games, good and bad, is their sprite work. Wayforward and Capybara Games are the last two bastions of great sprite work in the west with enough care and attention to their crafts to put them in the upper echelons of 2D games along with Vanillaware and Arc Systems. Mighty Flip Champs is no exception as Wayforward takes their sprite talent and applies it to a group of colourful characters which make the game even more endearing (and they even mask how bland the backgrounds and music are!). Where the game shines through the most is in the gameplay. For one thing this is one of the few DS games that is actually as "DS" game. I use this etymology because while you could arguably port this game to other consoles, Wayforward realised Mighty Flip Champs is best suited for the DS and designed it as such. This is a philosophy that applied to fewer games the more you think about it when the DS is usually assigned as an interface while Wayforward makes it a core aspect in all their games. 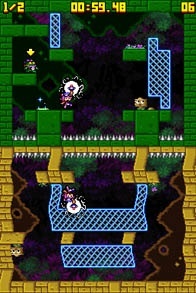 The gameplay is the simple goal of getting your character from Point A to Point B as is the staple in most puzzle/platformers. Might Flip Champs central trick is with the push of a button your character waves her magic scepter and the entire screen changes to a new area (previewed in the top screen). 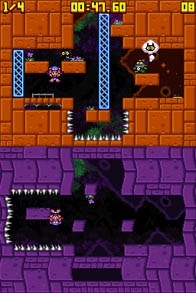 This causes the game to become part memory test as you predict what moves you need to make to get to the end (a complaint about Wayforward is that their games are designed for speed running but have no speed to them which is also true here) and part adapting to your surrounding in a way that not even the best action games can successfully mimic. Mighty Flip Champs is packed with content with over 100 levels to explore and Wayforward becomes even more creative when they start asking you to traverse the levels even more to attain items before going back (mandatory nonetheless). It's around this point in the game where you realise that Mighty Flip Champs isn't even really a game and it's more like some sort of genre exercise for amazing level design for 2D puzzle games in the same way that Portal is for 3D puzzle games. Mighty Flip Champs was also (somehow) ported to Playstation Minis which is nice if you don't own a DS but this game was clearly made for DSiWare and it deserves to be played as such on a DSI or 3DS. This was only the first game in the Mighty series, followed by Mighty Milky Way and Mighty Switch Force (Didn't like the former, haven't played the latter). This series doesn't seem like a concrete trilogy so more Mighty games could be made but it's going to take a lot of work at Wayforward to top Mighty Flip Champs.